With KB Home ProjeKt the Future is Now! Posted by Las Vegas Homes By Leslie - on Tuesday, January 15th, 2019 at 9:38am. KB Home ProjeKt design. Photo courtesy of BuilderOnline.com. Is your family's health and well being important to you? In this new millennia we are taking better care of ourselves and becoming active partners in our health and well-being. One big part of that is where we live. Wouldn’t it be nice if our home could become an active member of our family’s wellness team? Sound futuristic? With the new KB Home ProjeKt smart home model, tomorrow is on its way here today. 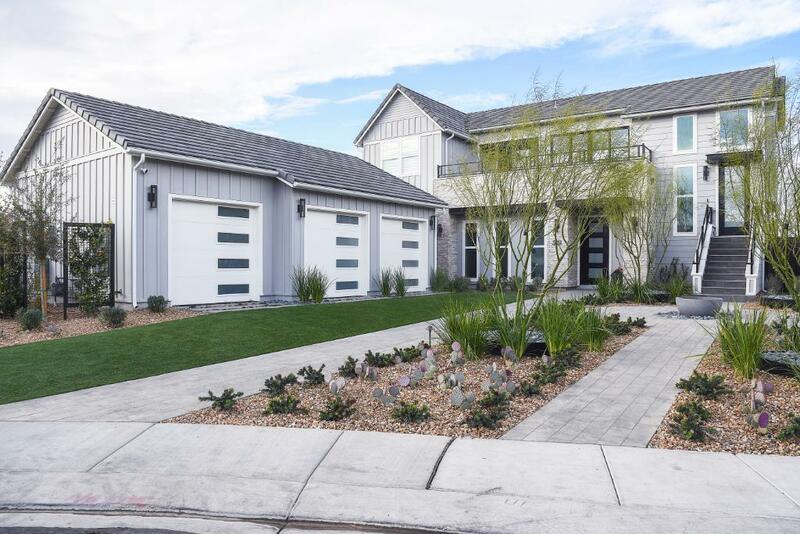 Located in the Henderson master-planned community of Inspirada, ProjeKt is an exciting new construction project by Las Vegas builder, KB Homes. Ideal for those seeking an active lifestyle, the community features 85 acres of walking paths, interactive parks, and open space. Learn more about the Inspirada community and current homes for sale. What technology is in this smart home? How much does the KB Home ProjeKt cost? The KB ProjeKt smart home model is the epitome of innovation in new homes in Las Vegas. Not only does this smart home filter your air and water, it fosters and promotes healthy living. With its effortless flow and responsiveness it almost becomes a part of the family. Automation and adaptability makes this house become a home that seems capable of loving you back. With Google as a partner, the Google Assistant will integrate and control nearly all components in the home, eliminating the need for multiple apps and remotes. The Delos’ DARWIN Home Wellness Intelligence platform becomes the brain of the home to increase wellness and decrease stress. The task of ensuring air and water quality takes place automatically, giving homeowners more time to enjoy their new home. It even learns the residents’ circadian rhythms and adjusts Hunter Douglas blinds and Noon lighting systems to encourage a more natural sleep cycle. So, you want to feed the family delicious healthy meals, but time is tight. Step into the kitchen of the KB ProjeKt Home instead of driving through the drive-thru lane. KB Homes has loaded it with smart appliances and features that should make it a breeze to prepare tasty, quick meals that are nutritious and satisfying. Fresh herbs and vegetables from the integrated green wall and tens of thousands of customizable recipes at your fingertips with the Yummly program make sure dinner will never be dull. To top it all off, enjoy peace and tranquility in the spa-like bathrooms with integrated technology that allows you to control lighting, water, steam, and music from the bath or shower. Mirror, mirror on the wall who’s the happiest homeowner of them all? Kohler’s new bath mirror with Google embedded will tell you that it’s you and your family. 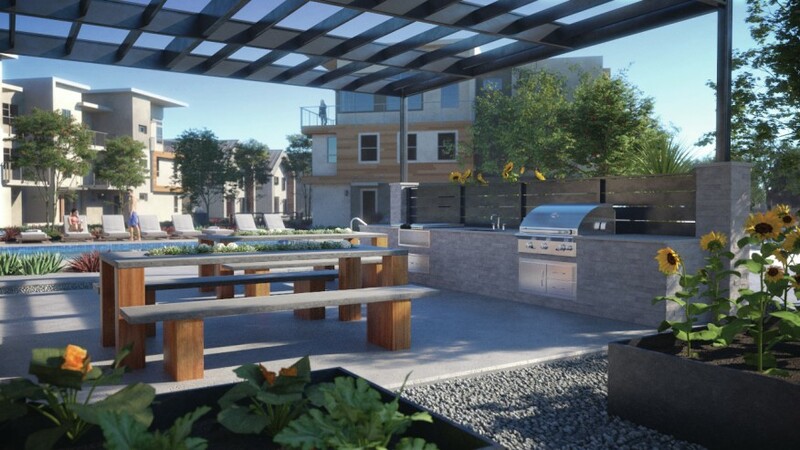 These new homes in Henderson are engineered to encourage more healthy social interactions. Shared front and backyard spaces bring residents together in ways that promote emotional and social ties. With more than 40% of Americans suffering from isolation and loneliness, this type of positive interaction is profoundly needed. Meet up for morning yoga in the raised yoga deck or share an evening meal in the fire pit lounge area. Spend a couple of hours on the weekend working with your neighbors caring for the garden, or the green wall. Maybe the adults meet up for a relaxing soak in the infinity spa after work on Fridays to offload the cares of the work week. Children can forge lifelong friendships with others in the community and experience better mental health by learning to socialize in healthy and productive ways. Parents can share childcare and homework duties, which will help to ease stress. No longer just a fringe movement, green building is quickly becoming the norm. Sustainability has gone from a nice option to an expected included feature. Homeowners are becoming more and more concerned with the impact that they, and their home, have on the environment and their housing desires reflect that. KB Homes designed these new homes in Las Vegas to bring that house of the future into the now. The KB ProjeKt home goes well beyond the impressive ‘double the energy efficiency of today’s homes’. In fact the entire home, from the walls manufactured by robots, to the high performance systems and appliances, is engineered to net-zero standards. With recycling in mind, the kitchens come with Whirlpool’s Zera Food Recycler. The homeowner can take kitchen scraps and turn them into compost within 24 hours. This gardener’s gold can be used in the home’s green wall, on houseplants, and in the communal vegetable gardening space. This allows reduction of landfill waste and production of healthier organic produce for the use of the family. The entire community is designed on environmentally friendly concepts. ProjeKt features 4 times more open space than typical communities the same size, 31% more homesites and 41% less roads. Due to the advent of autonomous vehicles, car sharing programs, and a walkable lifestyle, the neighborhood will have fewer cars, garages, and roads. This reduces emissions and allows for four times the open green spaces of a typical community. How Do These Bells & Whistles Impact the Cost? Another beauty of this concept is that the team had a goal of producing these homes at no additional cost to the homeowner. The money saved with reducing roads and garages was put toward providing the communal spaces and amenities. Not only that, the home takes a lot less time to be built and be move-in ready. In addition to not costing more than standard homes in Las Vegas, ProjeKt has a number of additional built-in savings. The energy efficiency features saves homeowners on their utility bills. The lowered stress and emphasis on healthy living can help to reduce the cost of healthcare for the entire family. The ProjeKt Home was engineered to care for the family, the community, and the environment. Any homeowner should be proud to live in one of these models of integrated design. This home does nearly everything to care for its residents short of tucking them into bed with a kiss goodnight.